Plymouth University is celebrating the 10th anniversary of the announcement of the creation of the Peninsula Dental School, then the first new dental school in the UK for 40 years. 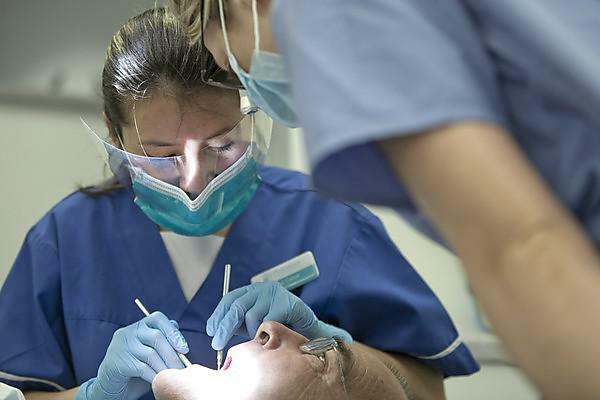 The announcement was made on 26 January 2006 and came after a declaration by the Government in 2004 about its plan to increase the number of dental training places in England. The Peninsula Dental School welcomed its first students in September 2007, and in early 2008 it opened its first Dental Education Facility (DEF) in Exeter. DEFs are where dental students treat NHS patient under the supervision of qualified dental health professionals as part of their studies. The DEFs are key to the innovative approach taken by the Peninsula Dental School to dental training, because it was the first and is still the only dental school to train students in a primary care environment, encompassing not just the general dental practice environment but also embedding the school, its students and staff in local communities where there is most need for dental care. There are four DEFs across the South West – two in Plymouth and one each in Truro and Exeter, where a new DEF with larger capacity is currently being developed. Since the DEF programme started more than 18,000 people across Devon and Cornwall have received NHS dental treatment where they may not have done so before. Work with the community was strengthened with the introduction of the Community Engagement Team, whose work has resulted in links, student projects, access to dental services and service improvements for a range of groups within the community – from the elderly and the very young to adults with learning and physical disabilities, asylum seekers, those who are homeless and substance abusers. Through working with the community a variety of initiatives have made huge impact and won awards. The “Open Wide Step Inside” immersive vision cartoon, designed to encourage good oral health awareness and routines in primary school children, is supported by global giant Wrigley and since its launch last year has been seen by 1,644 children across 23 schools in Plymouth. It recently received further funding from Wrigley to show the film to pupils from an additional 25 schools across two years. A project working with the Highbury Trust in Plymouth (a charity which supports adults with physical and learning disabilities) was the focus of an international dental conference last year, while flash cards developed for use by nurses in the Family Nurse Partnership in Plymouth as part of a student project, have been accepted for use by that organisation across the UK. In 2013 Plymouth University created the Peninsula Dental Social Enterprise to manage and develop the DEF programme and community engagement activity. The first dental students to graduate did so in 2011, and since then 287 dentists have graduated. As well as contributing to the number of qualified dentists in the UK, the Plymouth dental team has also had impact in research. Lab-based projects cover a variety of topics such as tooth regeneration, the effect of local anaesthetic on children’s teeth and the development of treatments for severe gum disease. Research investigating the delivery of dental care and oral health promotion covers issues such as addressing the national problem of poor oral health in children and oral care for those with physical and mental disabilities.